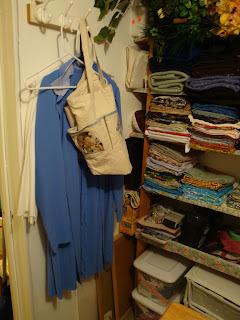 I mentioned that I was cleaning my sewing room a while back. I'm ready to share. It may look a lot like what I have shown in the past. What you don't see is how crammed full of stuff it had gotten. I wouldn't want to show you that!! Seems like I just kept adding and adding and I needed to take some things away. Now, I can breathe in here again. It's a small space (7 1/2 ft X 9 1/2 feet). Too small to be a room, but to me it's nice and cozy. 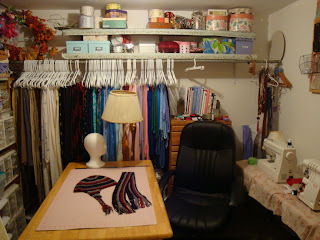 It was originally a small cellar, when we remodeled the basement, it became a closet. This is the wall that I face when I am sitting. 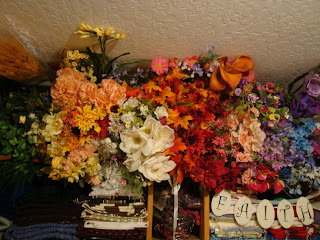 I took down all the flowers and found all kinds of things underneath...baskets etc. that I didn't even remember having!! I rearranged them by color. Below I folded my smaller fabric and I can actually see what I have. I separated them by 1 yard, 1/2 yard and 1/4 yard. I came across a label maker that I don't even remember buying. So, everything got labeled, well almost everything. The bigger pieces of fabric are hanging. I measured each pc and refolded, with a note pinned on it with the size. This hook is where I hang what I am working on. And, it ends up being a reject place as well. It's so hard to give up on something that isn't working. So, I just put them in a box and stuck them away. I love this shelf. 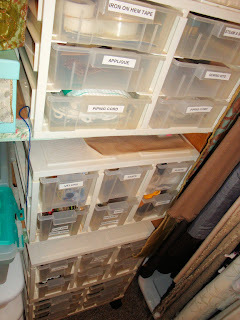 I put up all the odd shaped but cute containers. 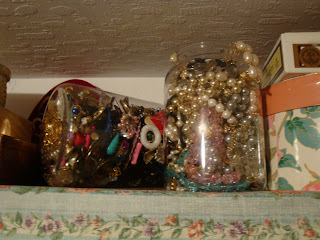 I wanted to put all my old jewelry in a clear container. This isn't even a fraction of all of it....hey it was the 80's..ya know? 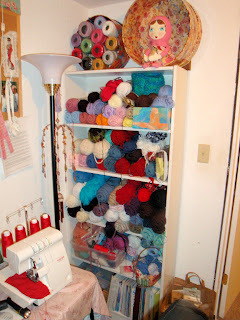 This corner is my yarn. I don't have an enormous collection. Do you see the pretty doll? That's Annabelle. I won her last year during the One World One Heart. She is a beautiful handmade doll and she moves around, she doesn't like to stay in one place long. 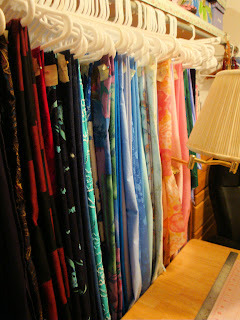 This is my pattern collection....I have lots of them! I don't have a fancy machine. I bought this out of the paper years ago. It suits my needs just fine....I wouldn't turn down a fancy machine mind you, but I am grateful for what I have. Here is a project waiting to happen. I would really like to create something wonderful in this space. I'm not an artist or a decorater, so it's difficult to come up with an idea. That's one thing I love about blogging, I get to see the wonderful things that others post, then I can use others ideas for my space. 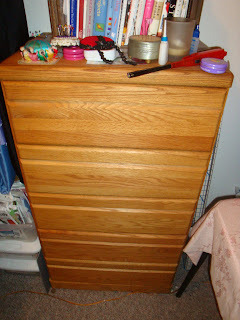 This chest of drawers my daughter left behind when she left years ago (she can't have it back now). 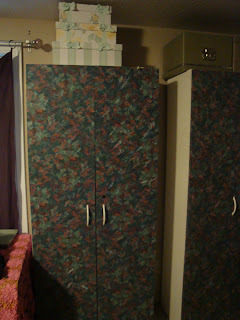 On the top I have some books, I tried to purge...the only book I got rid of was one that was all about 80's fashion. I guess it's almost vintage now. The pin cushions are special to me, the blue one on the left I got in Hong Kong, the one next to it was made by a friend, the red one is full of sand that is from my Grandma's pin cushion that wore out, and the silver one is a musical pin cushion also my Grandma's. 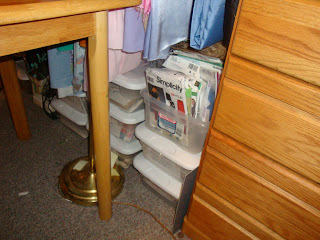 A couple of drawers are full of interfacing. 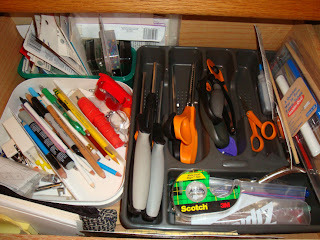 This drawer is the one I use the most. 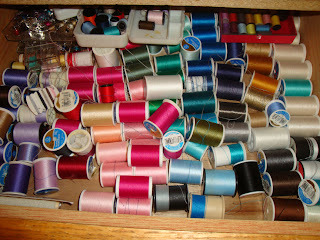 All this thread and I still often don't have the color I need. I try to by thread whenever I buy fabric. 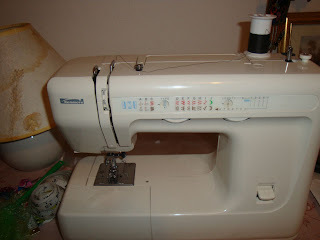 I have a serger, it's from Walmart, so it's not the best one. It drives me crazy actually, I have the most trouble with it. 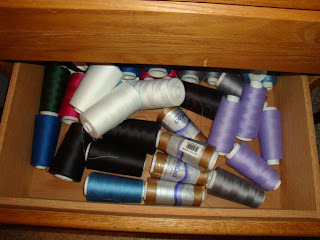 Here is my small collection of serger thread. I have managed to spill out into the multipurpose room. 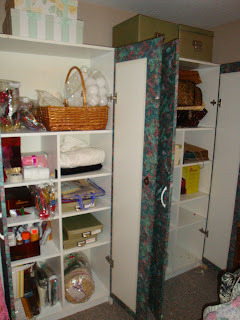 These two cabinets are now for crafting. Luckily I have plenty of room inside that is still available....shall we go shopping? Ugh. I loved this wallpaper that I put on them back in the 80's. I wish that they were the original white. That's a project for another day. Inside the left one I have dedicated the space to all things Wrapping. I told my daughter to always come over to wrap things. I have a lot of stuff to use up!! So, there you have it. Thanks for taking the tour. Happy crafting to you! I am sitting here in my home office, flying around the world on a magic carpet ride (see my post about One World One Heart). 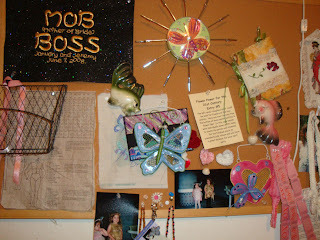 I am amazed by all the wonderful blogs and the intriguing artistry of so many people. My blog began a couple of years ago as I discovered a few blogs that drew me in and as I visited more and more, I was hooked. I love the little peek into the lives of bloggers and I am so happy to learn and grow from the experience. With all the new folks visiting Lulu's Cottage, I thought a quick introduction was in order. I have 2 doggies and 3 kitties who sometimes find their way into Lulus Cottage. Sewing is my first passion in the crafting world. I love to make garments to wear. Most of my creations end up in the "reject pile", but I can't stop myself! Sometimes I say that I have Crafting Attention Disorder. I see something wonderful and I immediately want to make it! 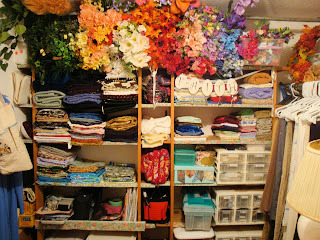 So, add to sewing: beading and all things jewelry making, knitting, crochet and home decorating. My little blog is a place to share what I'm excited about in the moment. Right now, I am completely consumed by being in a band. This is a long story...but here I am, in a Rock N Roll band. It sounds crazy just telling you about it. 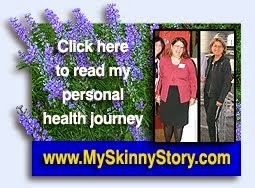 I love it and it has been an incredible journey of personal growth. One year ago, I wouldn't even sing in the shower. Now I'm singing into a microphone, is that crazy or what? Thanks for stopping by, I hope to see you again and call you friend. Welcome to Lulu's Cottage. Lulu here (aka Stephanie). If you are stopping by from the One World One Heart event, nice to meet you. I know you have about a billion blogs to visit, so I will be quick. I found OWOH last year and I had a BLAST visiting ALL (yes, I went to each and every one!). the wonderful entries. I found some new favorites to follow. I was amazed by the artistry of so many people. I won some fabulous give aways from all over the world. I can't tell you how excited I am that it is time for OWOH again! If you do not know what the OWOH event is....oh boy are you in for a BIG surprise! click here look at the list of participants and start visiting! On to my give away. 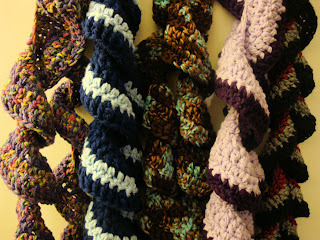 I crocheted scarves for Christmas and I loved them so much I made some just for OWOH. From left to right: light purple multi, navy and light blue, brown and blue multi, lavender and plum, red black and gray. Each scarf will have a winner. A close up for you.... 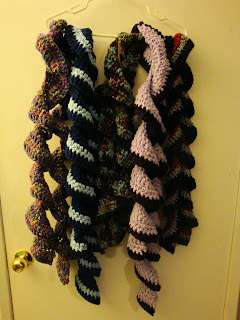 It got crazy last year....so I will be crocheting away with scarves to add if the amount of entries gets really big. I have a gray and black multi on the way right now. To enter. Leave a comment with your EMAIL ADDRESS (I have to contact you if you win, right?). If you are a OWOH participant, please tell me your entry number so I can come see you! And, if you like, tell me your favorite scarf color, either from these that I have shown or a color that you would like....who knows? The winners will be chosen on Feb 15. Enjoy your trip around the world as you flit from blog to blog...have fun! I can't wait to get started visiting everyone. It's raining again. That is a whole lotta rain! 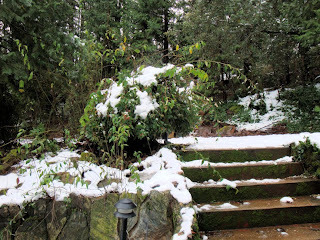 The snow is melting and we avoided any major damage. A friend of mine posted a picture on Facebook of a huge oak tree that fell at his place and that same day the picture showed up on the Sacramento News stations (2 of them!). 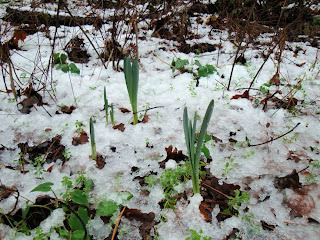 In the midst of all this WINTER are signs of spring....the daffodils are starting to come up! We lost our electricity twice. One day for a couple of hours the other day was six. 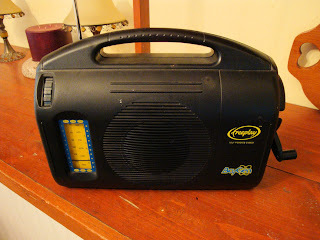 My handy friend here is my "wind up" radio. It sure does make my arm sore, but it's nice to have. You just wind the crank of the side and the radio comes on. 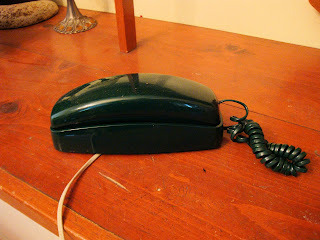 This is my old phone. I keep it in the cupboard just for when the power goes out. It has a really long cord. I was chatting with a girlfriend and I told her that I couldn't talk anymore because I couldn't keep HOLDING the phone up to my ear. I am so spoiled by my headset! Tomorrow the One World One Heart begins! Come back and see what I am giving away! It's raining...no POURING today. I live in California and we are having a DOOZY of a storm! It's okay. It can rain and rain...it can snow...just leave the power ON and I will be just fine!! Everything I had planned for today has been cancelled. It's a nice opportunity to do some blogging, cleaning...and who knows? 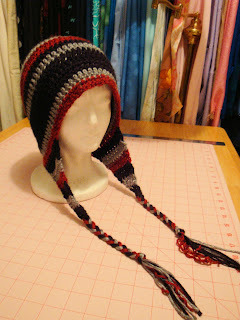 This is the same hat I made for my son for Christmas, except mine has the earflaps. I also made his tighter around the face. 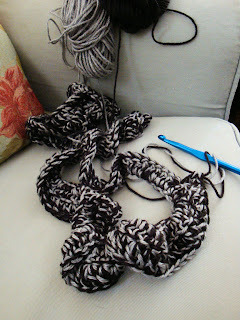 I love this yarn, it's sooooo soft! I think it needed a scarf. 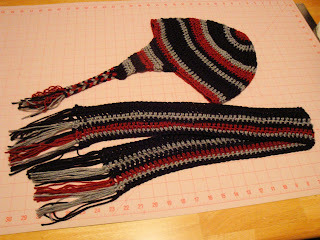 I tried making it with horizontal stripes, but I couldn't figure out how to keep the sides even. So, I switched to vertical. Just in time for all this cold weather! I'm so excited about the coming One World One Heart event that is coming soon! We had a "Groovy" New Year's Eve. Our Band, Crystal Image, performed our show "Hippie Party" at the Schoolhouse. Lot's of fun, dancing and singing along to all the favorites! The Band plus our friends who helped us man the door. Happy New Year. 2010. Going to be a FABULOUS year! !